All of the practices are are presented with clear simple to understand diagrams supported with objective, description, coaching points and progression (if applicable). This is a fantastic opportunity for you to learn from top Spanish academy coaches that have developed some of the key members of the fantastic technically skilled Spanish national side including Fernando Torres and Sergio Ramos. Jon Moreno Martínez explains to you the Spanish coaching philosophies at youth and academy levels. His methods and planning and shows you how to build training sessions. 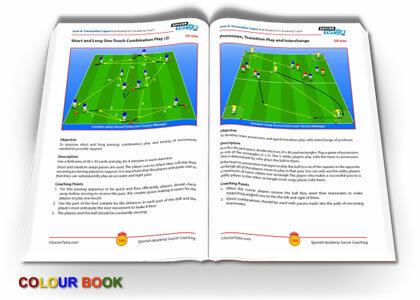 Jose A. Fernandez Lopez shows you how to set out dynamic and structured drills, as well as advice on how to run a successful football team. Iván Madroño Campos explains the importance of how technique is relevant to good decision making. Importance of how Technique is Relevant to Good Decision Making. 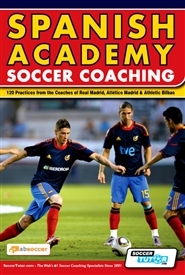 Learn from some of the of top Spanish Academy Clubs and coaches now! - if it\'s physcial goods, then you just need to pay the shipping cost to send it back to us before the full refund is processed. - Digital goods are issued within 12 hours of the reqest. If you find the same new product online at a cheaper price including shipping, let us know and we will beat it! Add Products To Cart > Checkout > Select Your Country on the Shopping Cart page. - Super quick and easy! Tactics Manager - after purchase, you will instantly receive your product key via email. This book is a good insight to how to train various ages and also helping me on my level 2 coaching course with practice ideas.